Jad wrote: To me, the SS class is for people who just want to drive what they bought and drive every day. A small allowance was made as this 'daily driver' often has after market wheels and tires for looks. However, if you are 'building' a car to optimize it, run CC, leave SS for the regular cars. It's also a daily driver, with over 11,000 miles in less than 14 months of ownership. I run 91 octane gasoline, have made no weight reduction changes, and have never touched the engine except for one oil change. Brakes, including fluid, are as delivered from the dealer. Suspension is as delivered from the dealer, with just alignment changes. So there's my build. I went down on wheel size to give me more choice of affordable tires, and I changed alignment and tires because the stock alignment and tires couldn't handle the demands of autoX. The subject of the thread was about tire rules -- I can state that the RE-71R tires are several seconds faster than the OEM Goodyear tires on an autocross course. Don't get me wrong, I'm definitely using the right tire to go fast by SS rules. But it's not because of size -- the extra 10mm width is probably inconsequential. It's because of tire compound. If you want to keep RE-71R tires out of SS, you could exclude them specifically. There was a lot of talk in the SCCA about doing exactly that for 2016 for their Street classes. They eventually decided that if you ask the tire manufacturers to make better autocross tires that are also usable for daily driving, you shouldn't panic when the tires show up and exceed your expectations. Your car is a good example. SS06 includes the 981 S & GTS cars. Your factory options would add 55 performance points , 20 for suspension, 20 for limited slip and 15 for PDK. And you have another 20 points in tire width (over stock, could be as much as 40). SO that is 75-95 points over what a "stock" 981 S might have. That is at least once class and possibly 2 classes in the CC designations. My proposal would allow for the performance options to be taken into account. 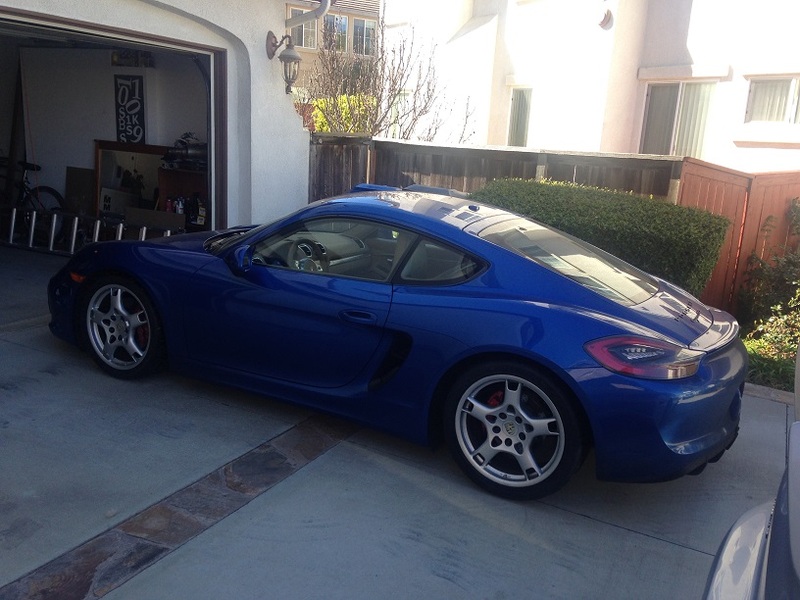 So if someone had a stock Boxster S they would run in a different SS class than yours. So when somebody would complain that their particular car didn't have a place to be competitive, the experienced guys would generally suggest that the guy wants to run I Stock. That's the class where "I" can be competitive. If there's a takeaway from your dissection of the car specs above, it's that we probably need to do a better job of directing the newbie in a base 981 Boxster S to go run CC08 instead of SS06 if he wants to be as competitive as possible. He's still likely to get beat, but at least he's not running against cars that point out 100 points higher than his. Putting a car in a CC class instead of a SS class does not make sense as they would be less competitive than if the SS classes had adjustments to move a car up a class due to the options it has. From what I can tell the SS classes are somewhat based on HP and weight to HP and are not weighted for things such as PDK or LSD which both have a competitive advantage and in the case of a PDK, not even possible in most cases if at all. Mods allowed in CC are far more aggressive than factory options. JayG wrote: I agree with Greg. This sounds as if we would just be making the SS classes into CC-Lite, where the only difference is that they would be running 140 treadwear tires or above. Yes, the CC classes allow more aggressive mods than the SS classes, but each mod adds points and drives you up in class. Every SS class car has a CC class alternative to run in when it is classified initially, and with no "aggressive" mods, it will be classified fairly low, so I don't understand how turning SS class into CC-Lite would be any more useful than just eliminating the SS classes entirely and having everyone run in CC class. When you say: "The goal should be to match the performance of the cars within a class to be as even as possible" that is exactly what the CC classes do, while offering you more choices for moving up and down the classifications by prepping the car differently (through tire choice, mods, etc.). With SS class, the only way to optimize your chances of winning is by buying the car that is most favorably classified due to its available options. That is the current reality--we can't have an "I-class" for each model Porsche (thanks to jbrennan for that definition! ), so they are always going to be lumped together in a range of models within each class, with one or two of the cars being the best performers in any given class. The Cayman GTS is probably the overdog for SS06, for instance. The GT4 will clearly be an overdog in SS08, I think (even without PDK). People buy certain model cars for various reasons, but if you bought the wrong one for our particular competition arena, the only thing you can do in SS class is optimize the tires and drive it faster (as Jad said, it's the driver that makes the car go fast). In CC class, you can take advantage of all the small mods that are not allowed in SS class to bring you up to the top of the point range for the class and equalize your potential with the other cars in a way that is not possible in SS. You may also save yourself money and frustration in the process, since many Porsches cannot achieve optimum suspension settings to maximize tire performance and wear without doing aftermarket mods that are not allowed in SS classes (like the adjustable lower control arm mod for all Boxster/Cayman/99x models to increase negative camber) that will help keep you from destroying tires prematurely. Greg Phillips wrote: As long as Bridgestone is willing to produce a tire with a treadwear rating of 200 that has the grip of tires with treadwear rating 100 or less, that will be the tire needed to buy to be competitive. The problem is that the RE-71R is NOT available to all competitors equally. They do not make it in sizes to fit all Porsche models. This is true of all of the specialized "Extreme Summer Performance" tires with 200 treadwear ratings that manufacturers have introduced to satisfy the demand for SCCA "street tire" classes. The new Porsches that come with 20" rims (and no option for 19") cannot buy anything nearly as competitive, without changing rim size or going to a lower treadwear rating. Steve Grosekemper wrote: Here are the 2016 PCR's on tires. Because of the point I made above, this is a really unworkable rule to "level the playing field" in SS. Some models in the same class will be able to use the best "street tire du jour" (which changes constantly according to the latest manufacturer's offering) while others will not, simply due to the OEM rim diameter and tire size not being available. Greg Phillips wrote: My proposal would allow for the performance options to be taken into account. I have no idea what your SS proposal is exactly, Greg, but I have to ask: "What will you do with SS09?" It contains the 991 GT3, the 991 GT3RS, the 991 Turbo S, the GT2, the GT2RS, the Carrera GT, and the 918 Spyder. Since SS10 contains the Cayenne, Panamera, and Macan, is there going to be an SS11, SS12, and SS13 to account for all the performance differences between this array of models that are all classed together? I just don't want to be left out of this SS class leveling because I didn't whine soon enough about having faster cars lumped into my SS class. For example a stock 98S in factory config, no options and factory tires which is SS02 would be put in CC06 if you added in virtually any other mod it would put it in CC07! Is there anyone realistically can tell me that it would be competitive? I happen to have inside information that an SS06-legal car will be running CC10 this weekend -- and although that wasn't his motivation, I hope he proves you wrong. That's what you need to do to get access to RE-71R tires. They don't make any 20-inch sizes. I'm sorry, but if what you are proposing is adding points for factory options to SS cars to raise them up in classification, then that sounds exactly like CC-Lite to me. They get raised in classification for every mod in the same way. Not true. I ran my totally bone stock SS09 GT3 in CC14 and won the class last year, in both our region and the Zone 8 championship. I see a 2000 Boxster S that placed second in our regional AX championship last year in CC06 and won one event. Is that not competitive enough? I don't happen to agree with you that a PDK is an overwhelming advantage. It is a 15-point penalty in our rules. A set of adjustable sway bars is 20 points. The difference between classes is generally 50 points. A PDK might be good for a half a second advantage on the average AX course, IMHO. Some courses might require only one shift (from first to second) and that's it. I have the most advanced PDK-S transmission in my GT3 and I've been smoked by drivers in manual trans. cars in and out of my class. It doesn't make that big a difference if you have a good driver in a well-prepped car who knows how to shift. I can agree that if a certain model (not just a certain config within a model) is an overdog, it should be moved up. It is much easier to do that then to concoct a scheme to balance the SS classes by adding points for factory options in the same way that mod points work in CC class. However, if cars are going to be put into a higher SS class, it needs to be by year and model, not by options. If what you want is to bump every car with a PDK up a class, I wouldn't agree with that. Look at the GT4--it is manual only, no PDK available, and I think it could dominate the SS08 class, even against PDK-equipped cars. James G-W brought his out with no setup at all on his first event last Nov. and took TTOD with it, beating all the other cars whether they had PDK or not. You can't convince me that PDK is a world-beating super-option. It is an advantage, no doubt, but not 2-3 seconds a lap as you said. You are trying to say it's A 50-point option instead of 15. Well, this may not be a problem for Boxsters and Caymans, as long as they can downsize to 19" rims, but since the RE-71R is not available currently in any size wider than 285, for the GT4, all newer Carreras and GTS/GT3/Turbo models that run a 295 and wider rear tire, they are not an option. Some of these models cannot be downsized to 19" easily if they have the PCCB option, either, as clearances are very tight. 1. While you can make more modifications in CC classes, they are designed to keep the cars in any particular class on a somewhat level playing field. A non optioned stock car will do just as well or better in a CC class. Since there are no options on that car, it get to be in a lower CC class than a heavily optioned car that it may have to compete with in an SS Class. 2. SS classes were designed to somewhat correlate with PCA National PCR's and to allow those with no desire to do anything other than run their car for fun a way to do that without some of the hassle of classifying and modifying their car for competition. 3. We went to the CC class system to simplify car classification and to trim down our previous bloated class system. If we keep increasing the SS classes, we'll have come full circle. 4. There is always somebody who can take a car and go really fast in it no matter what they're driving. Do not use that guy as an example of what's wrong with the system or why your car is in the wrong class. If you're unlucky enough to be in his class, change classes. It's much easier to do in CC. 5. Every car has a sweet spot in the CC classes. Find yours. Maybe it's not SS. Maybe it's CC05, or 06 or 07? 6. Take a look at how you're doing in the BRI. Now do the math using your CC class and see how that stacks up in the BRI. If you're not in the top 25, focus on your driving and don't worry about class and car. IMHO, anyone who wants to compete should drive in a CC class. If you just want the fun of driving, drive your car exactly as delivered with tread wear limits and tire size limitations in an SS class and know that you will most likely be at a disadvantage to a similar stock car with more factory options. Jay, had you run in CC06 last year in the AX series, you would have ended up in 3rd for the season, just as you did in SS02. You would have had more points available to stay in that class (39) which you could have used to make your car more competitive (wider tires, camber plates, etc.) I don't know how your car is set up, but you should at least have an aggressive alignment and come to terms with the fact that new tires are always faster than old tires and if all things in your chosen class are equal, new tires will usually win. If you want to compete, move to CC. If you just want to drive, stay in SS and understand that those rules are not designed to be as equal as the CC class rules. Good luck and keep driving! When you consider the array of options the newer cars have now, this is probably a true statement. No doubt having PTV & PDK will make you faster. So will RE-71's, wider tires and wheels. The real question though is by how much, and can that much change results between drivers. Very tough question to answer for sure. Impossible most likely. Between "good" drivers they probably make a large enough difference to change results. For a newbie or someone who isn't the fastest, probably not. Ultimately you keep coming back to the fact that (as noted by many on here) driver skill is by far the most impt. factor determining outcome at our level of driving. Considering that, IMHO, trying to break down SS classes based on points or which factory options a particular car has misses the point of SS classes, and, probably wont change results much anyway. I agree that it does turn SS classes into CC lite. If you run in SS class, and feel other cars in that class have an unfair advantage due to factory options, obviously you look at AutoX as a competitive endeavor, and are trying to win. I would add my voice to the others and say then move to CC class if you feel that way vs essentially destroying the intent of SS classes. That way, you can tailor your mods, and be classed with other cars much closer in potential to yours vs SS classes. I still think that even allowing wider tire and wheel widths in SS should not be allowed. Stock is stock. Ok to change tire brands/treadwear ratings only as long as the stock widths remain. If you want to start changing from stock to gain a real or imagined performance improvement, CC is where you need to be. I understand some running in SS classes are very competitive and don't want to go to CC due to a perception that they cant compete there, but unless we DO create points in SS, the CC classes are where you are going to find cars closest to being "equal". Last event in CC-08, I was 3rd, 0.24 sec behind 1st (Good driving Keith!) and 0.22 sec behind 2nd. This tells me the CC class system does a pretty good job trying to equate vehicles. "6. Take a look at how you're doing in the BRI. Now do the math using your CC class and see how that stacks up in the BRI. If you're not in the top 25, focus on your driving and don't worry about class and car." C) Practice, learn and improve my driving skills... It'll be an awesome day when its the car that's slowing me down, instead of the other way around! My own experience is that, by competing in the CC class, against optimized cars and experienced, competitive drivers, I've had to improve my skills drastically. The few times I've had a chance to use Katrin's bone stock 2005 base Boxster, I've easily won her SS class, by seconds if I recall correctly... and that's just down to experience. Although it can feel a bit like an arms race in the CC class, my impression is that once you find the right CC class for your car/setup, the within class variations aren't that drastic, and consistency and practice pay off -- maybe it was a fluke, but I was able to take 2nd in CC-12 last year in what turned out to be (after a mid-season dyno session) a CC-09 car that ran the first half of the season on RE-11s (AKA, the *real* 200 treadware Bridgestones).